President Robert Mugabe`s closest allies in the party he founded are calling on him to step down, as pressure on him intensifies following a military intervention and protests. Senior party officials have started arriving for a meeting of Zanu-PF in which they will discuss whether to dismiss Zimbabwe`s long-term leader. The party`s Youth League, previously loyal to him, has turned against him. And military leaders are set to meet Mr Mugabe later on Sunday. Mediation will be led by a Catholic priest, state TV said. In a statement the Zanu-PF Youth League condemned Mr Mugabe`s allies for "looting and plundering" and his wife Grace for "vulgar, cunning and unruly behaviour", and called on him to stand down and to "rest as an elder statesman". Nine of 10 Zanu-PF party chapters say Mr Mugabe should step down and their decision is likely to be endorsed at Sunday`s meeting of the party`s top body, the central committee. The head of the influential War Veterans Association, Chris Mutsvangwa, predicted to Reuters before the meeting that Mr Mugabe would be removed from the party leadership, and his wife would lose her position as head of its women`s league. He then threatened to "bring back the crowds and they will do their business" if Mr Mugabe did not step down. Mr Mugabe has largely been confined to his house since the army took over on Wednesday. The army took control of the country after Mr Mugabe, 93, fired his deputy Emmerson Mnangagwa. Mr Mnangagwa`s dismissal made Mr Mugabe`s wife Grace front runner to become next president. He is likely to be reinstated as vice-president when Zanu-PF convene. Mr Mugabe has led Zimbabwe since independence from Britain in 1980. 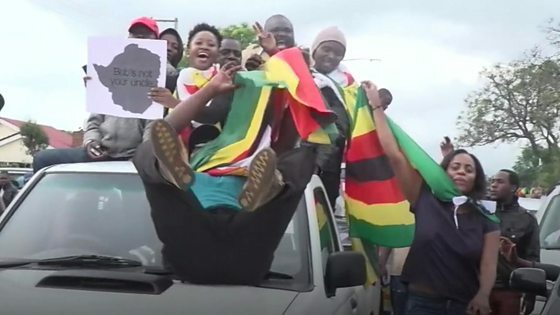 Tens of thousands of Zimbabweans, including people from the ruling party and the opposition, took to the streets on Saturday to celebrate the army`s takeover and to urge Mr Mugabe to quit. They tore up pictures of the president and marched to his office and residence. The BBC`s Andrew Harding in Harare said it was a watershed moment and there could be no return to power for Mr Mugabe. He may face impeachment in parliament next week if he refuses to step down. Our correspondent says the situation appears to be getting out of Zanu-PF`s control and there could be a broad push to introduce a transitional government that includes the opposition. Negotiating Mugabe`s exit Analysis by Anne Soy, BBC News, Harare It is understood that President Mugabe has so far insisted that he cannot step down and so legitimise a coup. The military maintains this is not a coup and there is international pressure to use constitutional means to resolve the political crisis. Negotiators are poring through Zimbabwe`s laws to find a legal way out. Saturday`s call for civilians to take to the streets looks choreographed to lend some legitimacy to the transition process being discussed. President Mugabe`s support base has continued to crumble. Independence war veterans, who fought alongside him against colonial rule, have also called on their former leader to leave. But the biggest blow yet to Mr Mugabe could be delivered by the central committee of his ruling Zanu-PF on Sunday. Their meeting could see Robert Mugabe dismissed as party leader. How did we get here? Soldiers seized the headquarters of Zimbabwe`s national broadcaster ZBC on Wednesday. An army official, Maj Gen Sibusiso Moyo, then read out a statement on national television, assuring the nation that President Mugabe and his family were safe. The military was only targeting what he called "criminals" around the president, he said, denying that there had been a coup. On Friday, Mr Mugabe made his first public appearance since being put under house arrest, speaking at a university. Grace Mugabe was not present. It had been thought she had left the country but it emerged on Thursday that she was at home with Mr Mugabe.